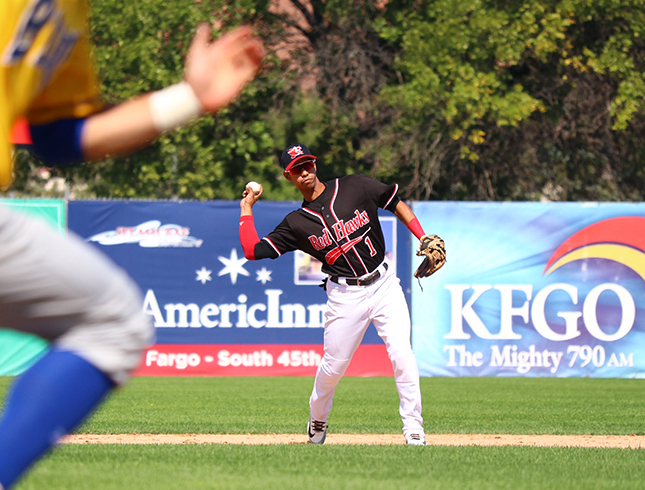 09/02/2018 3:20 PM - FARGO, N.D.  A solo home run from Tim Colwell in the sixth inning of Saturday afternoons game provided the winning run for the RedHawks as Fargo-Moorhead defeated the Sioux Falls Canaries 3-1 to clinch a series win with one game left in the 2018 season. The RedHawks had a 1-0 lead until the sixth inning, when Sioux Falls tied the game on an RBI-single from David Bergin. Colwells third homer of the season put the home team back on top with three innings to play, and the Hawks added an insurance run in the eighth to secure the victory. Michael Tamburino struck out eight in six innings on the mound to earn his seventh win of the season in his last start of the year. Tamburino is 7-7 in 20 starts this season. Benji Waite and Geoff Broussard held the Canaries scoreless after Tamburino left the game, and Randy McCurry came on with the bases loaded in the eighth to shut out the visitors and earn a four-out save. McCurry has 17 saves this year for the RedHawks. Fargo-Moorhead will face the Sioux Falls Canaries one final time to wrap up the 2018 season tomorrow afternoon at Newman Outdoor Field. First pitch between the RedHawks and Canaries is scheduled for 1 P.M. in the Labor Day meetup.